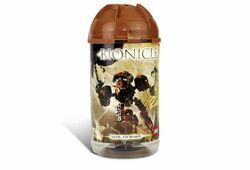 8604 Toa Onewa is a BIONICLE set released in 2004. This is the third brown Toa of Stone BIONICLE set produced, though he came before the first two in the storyline. This is a description taken from LEGO.com. Please do not modify it. (see an archive of the product's page) Hero of Metru Nui's region of stone! His mask is the Kanohi Komau, the mask of mind control. Facts about "8604 Toa Onewa"